He was born in 1928 and grew up in Wilkes-Barre, Pennsylvania and began building boats when he was 12. His first boat sank, but he fished it out of the Susquehanna River, near his home, and made it into a home for snakes. Darby and his wife made their home in Saint Johns, Florida, where he died on December 3, 2016 at the age of 88. Darby first conceived of a hand-operated square sail attached to a catamaran in 1948, when he was 20. In the mid-1960s, Darby conceived the "Darby Sailboard": a hand-held square rigged "kite" sail on a floating platform for recreational use. Darby had taught himself to sail a 10-foot model on lakes in high wind between 1964 and 1965. He published his design in August 1965 Popular Science magazine, and although it did not show any connection between the rig and the board (i.e., a universal joint; the mast simply rested in a depression on the board) it did refer to a "more complex swivel step for advanced riders not shown." The sail was like a kite and was sailed with one's back to the sail. Popular Science magazine was published in many countries around the world, establishing the Darby sailboard as "prior art" in many legal jurisdictions. Darby and his wife Naomi organized Darby Industries, Inc. in 1964, with his brother, Kenneth, was also active in the company. However, the sailboard design never gained popularity, and Darby's company ceased operations by the end of the 1960s. Darby did not patent his design or any of his subsequent models attached to surfboards, and the Californians Jim Drake (a sailor) and Hoyle Schweitzer (a surfer) took out the first patent on Drake's Windsurfer design in 1968. The universal sail system with pivotal mast was already in public use from Darby's invention at that time. Developed commercially through company Windsurfing International Inc., after Hoyle bought Drake out of his half of the patent for $36,000, he quickly expanded the company thorough licensing the patent internationally. However, Europe was now the largest growing market for windsurfers, and the sub-licensed companies - Tabur (later Bic Sport), F2, Mistral - wanted to find a way to remove or reduce their royalty payments to Windsurfing International. Tabur lawyers found prior art, in Englishman Peter Chilvers, who as a young boy on Hayling Island on the south coast of England, assembled his first board combined with a sail, in 1958. In Windsurfing International Inc. v Tabur Marine (GB) Ltd, with Tabur backed financially by French sailing fanatic Baron Marcel Bich, British courts recognized the prior art of Peter Chilvers. It did not incorporate the curved wishbone booms of the modern windsurfer, but rather a "straight boom" that became curved in use. The courts found that the Schweitzer windsurfer boom was "merely an obvious extension". It is worthy of note that this court case set a significant precedent for patent law in the United Kingdom, in terms of inventive step and non-obviousness; the court upheld the defendant's claim that the Schweitzer patent was invalid, based on film footage of Chilvers. Schweitzer then sued the company in Canada, where the opposition team again financially backed by Bic included Chilvers and Jim Drake, and lost again. After the cases, no longer obliged to pay Windsurfing International and royalty payments, the now renamed Bic Sport became the world’s largest producer of windsurfing equipment, with an annual production of 15,000 boards. In 1983, Schweitzer sued Swiss board manufacturer Mistral, which is today still a major sailboard manufacturer, and lost. Although started before the British case, it ended after the closure of the Canadian case, with Mistral's defence hinging on the work of Darby. In the 1980s, Darby received a design patent for a one-person sailboat, the Darby 8 SS sidestep hull. His latest project is called the Windspear, a combination kayak, canoe, and surfboard, with a paddle and fin combination. Darby's latest design (2006/2007) is being tested, timed and fine tuned. ^ Horobin, Wendy (2003). How it Works: Science and Technology. Marshall Cavendish. p. 2006. ISBN 0-7614-7314-9. ^ "S. Newman Darby Windsurfing Collection, 1944-1998". Archives Center. National Museum of American History. Archived from the original on 19 February 2015. Retrieved 20 April 2015. 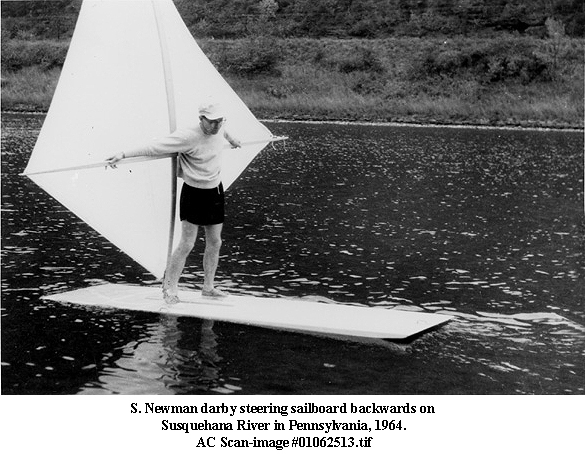 ^ See photograph of S. Newman Darby on Susquehana River in 1964 Archived 2009-06-13 at the Wayback Machine at Archives Center. ^ a b "Darby Electronic Museum". Windsurf.mediaforte.com. Retrieved 2013-04-22. ^ a b "Lemelson Center Invention Features: Newman Darby". Invention.smithsonian.org. Archived from the original on 2005-11-23. Retrieved 2013-04-22. ^ a b "History". Bic Sport. Retrieved 2009-06-05. ^ E. L. Cussler, G. D. Moggridge. Chemical product design. Retrieved 2009-06-05. "S. Newman Darby Windsurfing Collection, 1944-1998". Archives Center. National Museum of American History. Archived from the original on 19 February 2015. Retrieved 20 April 2015. This page was last edited on 15 January 2018, at 11:07 (UTC).